Each of us has number of user accounts at different social websites. Updating and managing each of them can take lot of time and effort. Just like web service Ping.fm – Hellotxt allows you to keep status updated on multiple social websites. It supports number of popular social networking websites. To get started, select the social networking website of your choice (for example Twitter). Then login using accounts details related to selected website (for example Twitter login details). Post your message (or tweet) and Hellotxt will send and update. 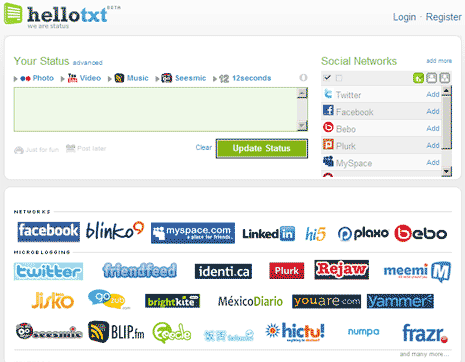 HelloTxt is ideal for users dealing with multiple social websites and save some time / effort.